I’m writing to you live from Orlando, Florida. I’m at Disney World with my wife. Flew over here directly from my trip to DC/Virginia to continue my crazy summer adventure, and man, was it worth it. I got to finally ride the Avatar: Flight of Passage ride at Animal Kingdom in Disney World. I did read a book for today’s review, but the experience of that ride was too good for me not to talk about it today, and if any of you reading this are heading to Animal Kingdom any time soon, this ride is a must. It’s the first ride I’ve ever ridden that actually made me sad to be slightly older. I saw a kid get on the ride; he was about eight-years-old, and I was excited for the rides that he will get to see in his time on this earth. I know I’m not old, but it makes me sad to see something as amazing as this ride and know that rides will topple this experience after I’m gone. If that sounds a bit extreme, sorry. Some of you know what I’m saying though…the rest of you might not LOVE thrill rides as much as the rest of us. You proceed to sit on one of these bike-type vehicles, get strapped in, put on your 3-D glasses, and are taken to the world of Pandora on the back of a Banshee. The ride is fantastic! One of (if not) the best ride experiences of my life. It’s not perfect. 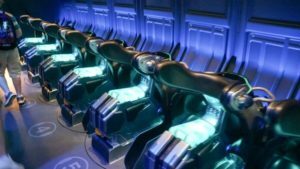 I think we still have a way to go with VR tech that will replace much of the 3-D experience at theme parks, but riding these bikes into a 3-D Pandora is beautiful. The experience is comparable to the Harry Potter rides at Universal, but there is more of an individual feel to this ride that makes it more personal. And while it’s a personal experience, one of my favorite moments came during the ride when a couple of woman, around 45 or 50 squealed with excitement and laughter the entire time. I love the effect I’ve been lucky to see this ride have on people. Myself included, and I hope to not only actually bring others to the ride, but encourage you to visit as well. Disney is not paying me…I swear. The wait is crazy, and I’d say worth a decent wait, but register your trip early, and sign-in for your Fast Pass a couple months ahead of time like we did. It’s nice to see Disney putting money back into the parks. Things were stagnant for some time, but the Universal builds help push the Disney changes, and the competition is a great thing! Now, we just need Disney to invest in more than 1/4-ply toilet paper!